A summary of what global warming of 1.5°C and higher means for Ghana. CLICK TO ENLARGE. 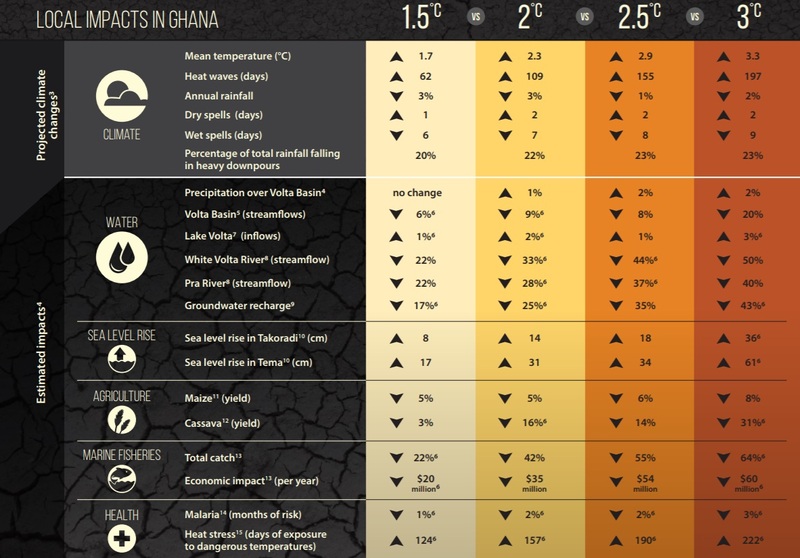 This infographic* produced by the Adaptation at Scale in Semi-Arid Regions (ASSAR) project sumarises the impacts of warming scenarios from 1.5-3°C in Ghana. For Ghana, local warming will be greater than the global average. Even a 1.5°C increase in global temperature will have severe local impacts, affecting water resources, agriculture, sea level rise, fisheries, health, and other vulnerable sectors. This means there is an urgent need to accelerate Ghana’s adaptation responses to support its development agenda.